The president of the Baa Atoll Thulhaadho council, Ahmed Abdul Raheem, was suspended for one month without pay over a tweet in which he opposed the education ministry’s plans to hold a parade for students on May 30. In a tweet on May 29, Ahmed said the main opposition Maldivian Democratic Party (MDP) will start a door-to-door campaign to discourage students from participating in the parade. The LGA, headed by home minister Umar Naseer, sent a letter to the council within hours asking why Ahmed had called for students to avoid the parade. The letter also warned the LGA will penalize any councilors who obstruct the parade. In reply, the council said it was not aware of such a tweet. The LGA then sent a second letter last week ordering the council to withhold Ahmed’s salary. “This is a ridiculous move by the government aimed at destroying the decentralization system and this decision was made by Umar Naseer and his special committee,” Ahmed said. He vowed to contest Naseer’s letter at the court. He also said he had not participated in the door-to-door campaign and was not aware if such a campaign had taken place. All Thulhadhoo councilors are MDP members. Naseer was not responding to calls at the time of going to press. On May 31, the LGA suspended three councilors of the Alif Alif atoll council over a resolution declaring that the council will not participate in the Independence Day activities. All six members of the atoll council belong to the MDP. The Thulhadhoo council will meet on Wednesday to decide on Naseer’s letter, said vice president Ahmed Rasheed. 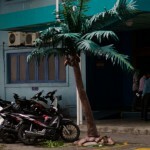 In late May, the LGA had asked the Thulhadhoo council to withhold pay of their councilor Ziyau Rasheed, who was suspended for 2 months following his arrest at the opposition’s mass anti-government protest on May 1. The council had defied orders saying that the authority’s order was contrary to relevant laws and regulations. Unless a court of law rules otherwise, the Thulhaadhoo council said it would be following an “unconstitutional order” if it enforced the decision. In a letter on June 1, the council told the LGA to stop threatening the council and said the only office authorized to penalize councilors were the police and the courts. A total of seven councillors were suspended for two months without pay for participating in the May 1 protest. 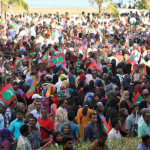 Nearly 20,000 people took to the streets of Malé on May Day demanding the release of Nasheed and ex-defence minister Mohamed Nazim. In early May, MDP island and atoll councillors in Noonu atoll decided to chip in to pay the salary of suspended Holhudhoo councillor Hussain Habeeb.